AUSTIN (DEC. 5, 2018) – The Austin Spurs, presented by SWBC, will partner with Toyota of Cedar Park to host their annual Season of Giving game on Saturday, Dec. 15. Tipoff against the Iowa Wolves is set for 7 p.m. Fans are encouraged to bring an unwrapped toy to Toyota of Cedar Park starting today that can be exchanged for a voucher good for four tickets to the Season of Giving Game. All toys will be donated to the United Way of Williamson County. At the game, fans can purchase raffle tickets for $5 each or five tickets for $20. The winner will receive four lower level tickets to a 2018-19 regular season San Antonio Spurs game along with a Toyota Tundra to use for a weekend with a one-night stay at a hotel in downtown San Antonio, courtesy of Toyota of Cedar Park. A snack bag for the trip and a gift certificate for dinner is also included, courtesy of United Way of Williamson County. The Silver and Black will wear special holiday-themed jerseys that will be signed and auctioned off at austinspurs.com. Fans will have the opportunity to cast their bids starting Monday, Dec. 10 at noon until 8:30 p.m. on Dec. 15 with all proceeds benefitting United Way of Williamson County. Fans can text “Spurs” to 52182 to register. Local charitable organizations and the hundreds of children and families they serve have been invited to attend the game courtesy of Toyota of Cedar Park. Children can visit Santa on the concourse at the game to receive a free stuffed animal donated by PetSmart of Cedar Park. Fans are asked to support the night by wearing tacky holiday-themed sweaters. As part of the NBA Cares Season of Giving, the NBA, WNBA and NBA G League hosts hundreds of charitable events across the country in an effort to spread holiday cheer to thousands of children and their families. 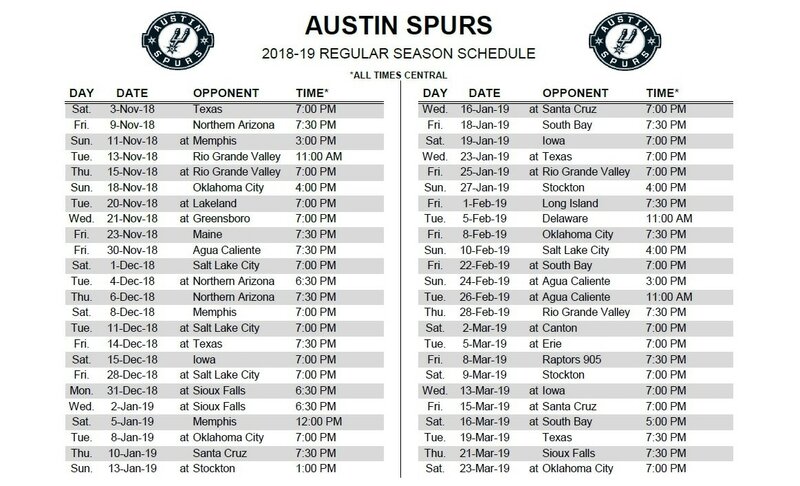 To purchase tickets or find more information regarding the Season of Giving game, call the Austin Spurs office at (512) 236-8333 or go to austinspurs.com.